What is ebola & how does it affect us? Objective: To find out what the Ebola virus is and how it can be spread. All tasks can be completed by completing the work booklet by clicking on the blue tab to the right. Starter - Videos From Memory. Watch the 60 second video to the right hand side that explains what Ebola is, the symptoms and how it is spread. Now complete the tasks in the work book. Task 1 - How & where did Ebola start? Click this link from livescience.com to read about where scientists believe that the Ebola virus came from. Then watch the Hans Rosling video to the right - Why did Ebola Spread in West Africa? Complete the tasks in your work booklet in your own words. 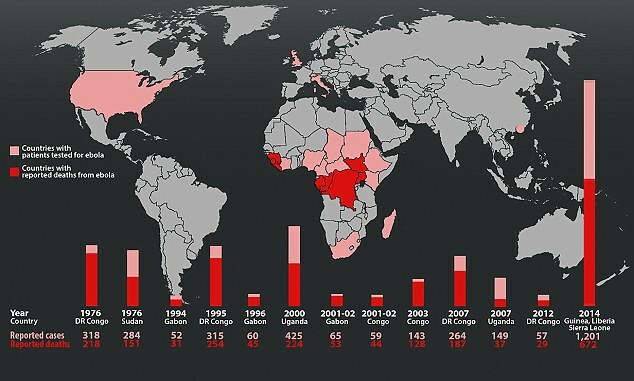 Task 2 - Mapping the historical spread of Ebola. Using the same link as task 1 and the map on page 2 of the work booklet, completed the tasks set out. You will need colour pencils and an atlas or Google Maps. Task 3 - How bad is Ebola compared to other viruses? 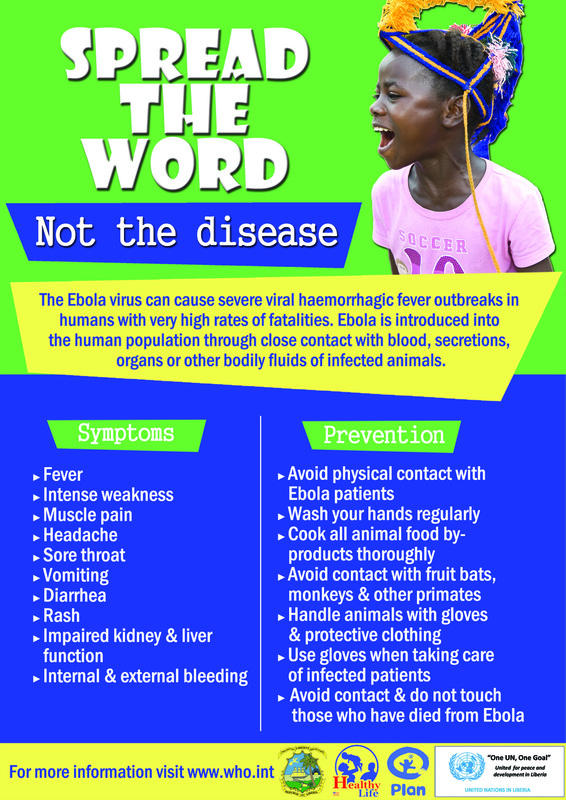 Click this link to be taken to an infographic about Ebola. Scroll down to the section entitled 'Sorted By Number of Deaths' and complete the activities as set out in the work booklet. Task 4 - How deadly is Ebola? Using the same link as above, but scrolling down a little further to 'Sorted by Deadliness', complete the activities in your work booklet. Task 5 - What are the signs and symptoms of Ebola? Using the graphic to the right hand, complete the activity in your work booklet. Task 6 - How to avoid catching Ebola. You know that Ebola is transmitted through contact with bodily fluids and that it is not airborne and so can, to some extent, be controlled. Click on this link from the BBC and watch the second video from Hans Rosling to the right. Then complete the three activities set out in your work booklet. **Update 8th October** Spanish Nurse & Ebola. BBC News article here. Task 7 - Is Ebola only deadly to the poorest? You will see that the mortality rate (number of people who die) for Ebola in the affected areas in West Africa is between 50-90%. Click here for a live updated map showing current and new cases of Ebola in West Africa. This map shows you other countries in the world who have Ebola cases. Click here for a live updated spreadsheet showing total number of deaths from Ebola in the affected areas. As of this page being written on October 8th 2014, 3431 people had died. Has this number increased since then? Watch the two 'Ebola survivor' videos to the right. The first is about a doctor from the USA who contracted and then survived the disease and the second video is about a UK aid worker who had the same experience. Then read the BBC News article beneath about the drug that the UK survivor received - ZMapp. Now complete your piece of extended writing on the work booklet using the ideas provided. "Level of economic development will determine the mortality rate of the Ebola virus". "Globalization can be a contributor to the spread of, and be the eliminator of the Ebola Virus". Discuss what is meant by this statement (15). 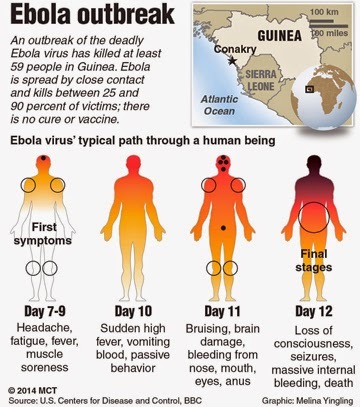 Ebola warnings - spread the word!